A return air grill connects to ductwork that allows air to return to any cooling or heating system. The openings that connect to ducts and other spaces for the returning air are normally covered with grillwork. Every cooling or heating system will have air being pushed though into rooms and spaces through a system of ducts. This increases the air pressure in the conditioned area and at some time will act to even prevent any further air from entering unless a circulating system is set up to relieve the pressure. This is done normally through return ducts which allow the air to be recirculated or completely vented to the outside in certain cases. A return air grill will cover such ducts, and can also act to regulate the flow of air. They also act to close off the ducts from view. A return air grill also has a filter mounted on it to trap particulate matter and thus ensure that the recirculated air is more pure. This can also in the long run reduce the amount of cleaning required for ducts. Ducts for returning air are located at floor level or in the walls depending on the design of the system. These require to be covered by a grill that will ensure that duct is protected. It is considered very necessary to use filters over such grills, which in turn can lead to higher efficiency in cooling or heating. The filters in a way also help to reduce air flow and thus help improve efficiency. Such filters can have increased ratings which in turn can reduce allergens and dust and thus make the circulated air more healthy. A return air grill looks very much like the supply side grills and can only be detected with the direction of the air flow in front of the grill. It is necessary that the space around such grills be kept free of any obstruction, as this can affect the entire system. As a matter of fact, it is best to ensure that all grills, whether supply or return, are kept clear and allowed to function as they are designed. 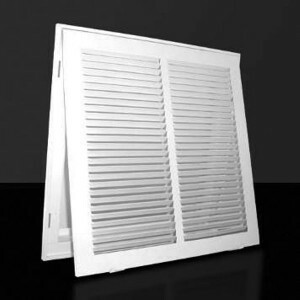 A return air grill and its filter needs to maintained and cleaned at least once every quarter. Such cleaning can also lead to a system functioning with less noise, as a clogged filter can increase the noise level, because of the greater strain placed on the blowers and fans.